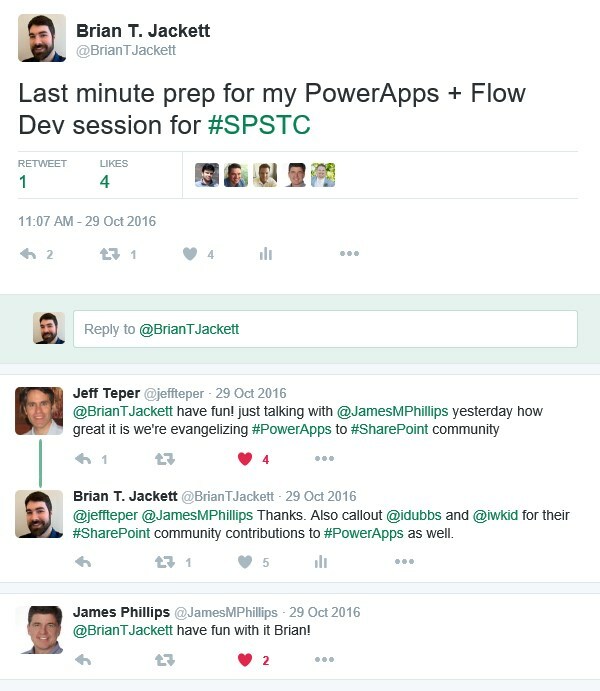 After a few years away I was able to present at SharePoint Saturday Detroit 2016. A big thank you to all of the attendees, sponsors, organizers, and other speakers. Below are my slides and a link to a GitHub repo with the demo projects that I used for the final demo. This includes the Azure SQL DB project, API app, and Web App. If you have any feedback or questions feel free to leave a comment below. After many months away from blogging and speaking (baby #2 was born recently) I’m speaking at a few conferences in the coming months. If you are attending any of these conferences please stop by and say hi. Looking forward to returning to each of these events. Here are the sessions and abstracts. Abstract: PowerApps and Microsoft Flow are enterprise services (currently in preview) that allows power users and developers to build scalable applications that connect with numerous consumer and enterprise sources using PowerPoint and Excel-like tools. In this session we will overview the integration points for PowerApps and Microsoft Flow with various sources such as OneDrive, Twitter, Azure, and more. We will also talk about the developer story for integrating with custom APIs and on-prem data sources such as SQL Server and SharePoint. Lastly we will demo a number of scenarios to show how easily you can create and consume apps across Windows, iOS, Android, and web. Abstract: With an MSDN subscription you can run your dev / test environment in Azure IaaS for less than the cost of a cup of coffee each day. In this session we will overview the basics of Azure IaaS (Infrastructure as a Service), the pieces you will use to be successful deploying SharePoint in Azure (including the new Azure Resource Manager templates), and how to use resources as efficiently as possible to reduce your costs and boost your farm performance. This session is targeted to SharePoint developers and administrators. Prior knowledge of Azure is helpful but not a requirement.